We have been using the Sport Berkey water bottle since 2014 and take it everywhere we go. This portable water purifier uses the filtration benefits of the larger Berkey water purification systems except it’s in a bottle. As much as we love our Travel Berkey, we can’t take it with us on the trail. The Sport Berkey is great for a day out on the town where we can refill and filter from just about any water source. If you’re in the market for a portable water purifier, check out our Sport Berkey water bottle review. Berkey states that the filter in the sport bottle is the same as their larger system and “is designed to remove or dramatically reduce toxic chemicals, heavy metals, volatile organic compounds, trihalomethanes, detergents, pesticides, herbicides, chlorides, pharmaceuticals, petroleum-based products, unpleasant tastes and odor, silt, sediment and chlorine.” Read more about Berkey’s filters on their website. In short, you can filter just about any water. 160 refills of water from any source or 640 refills from municipal water sources. The Sport Bottle filters water on-demand. Unscrew the top, fill up the bottle, secure the top and flip open the piece protecting the rubber straw and enjoy. A combination of sucking through the straw while squeezing the bottle seems to allow for maximum flow of water through the filter. When we first opened the package, the Sport Berkey looked substandard compared to our Travel Berkey. Plastic top, a soft rubbery exterior, and the filter dangling inside the bottle attached by a straw. We were skeptical about how much abuse this water bottle could withstand. Eager to test the water bottle, we took it on a trip to Paris, France. When we arrived at our hotel, we were tired, thirsty and not in the mood to find a place to buy bottled water. I ended up filling up the Sport Berkey from the bathroom sink. Paris water is safe to drink so I tasted the tap water for comparison. Straight from the tap, the water had a metallic dirty taste, not a flavor I wanted in drinking water. The Sport Berkey changed the flavor of the water. It tasted pure and refreshing, similar to the taste of water from our full size Berkey. We were so impressed that we took the Sport Bottle everywhere with us. We filled up the bottle before we left the hotel each day. Once we drank the entire bottle, one of us would pop into a bathroom or find a water fountain to refill. Neither one of us would typically walk into a public restroom to drink water from the sink, but we had no problems with the Sport Berkey. The features we initially mistook as “substandard”, turned out to be the bottle’s best assets. The soft exterior of the bottle allowed us to easily squeeze it. This allowed us to pump water into glasses or bottles. The plastic top kept the bottle light, and proved to be very sturdy. The loop at the top of the bottle was useful for securing to a carabiner or to use as a handle. Finally, the filter element was unscathed even after all the beating we put the Sport Berkey through. The most notable thing is that we didn’t have to buy a single bottle of water during our trip. Fast forward a few years and we are still using our Sport Berkey as we travel around the U.S. in an RV. If you’re wondering, the company sells filter replacements for the bottle or you can buy a new unit. Nothing is perfect, even the Sport Berkey. During all of our adventures, the bottle developed a tiny leak where the lid screwed on. We found that the bottle had to be over tightened without breaking it, otherwise water would make it past the seal. 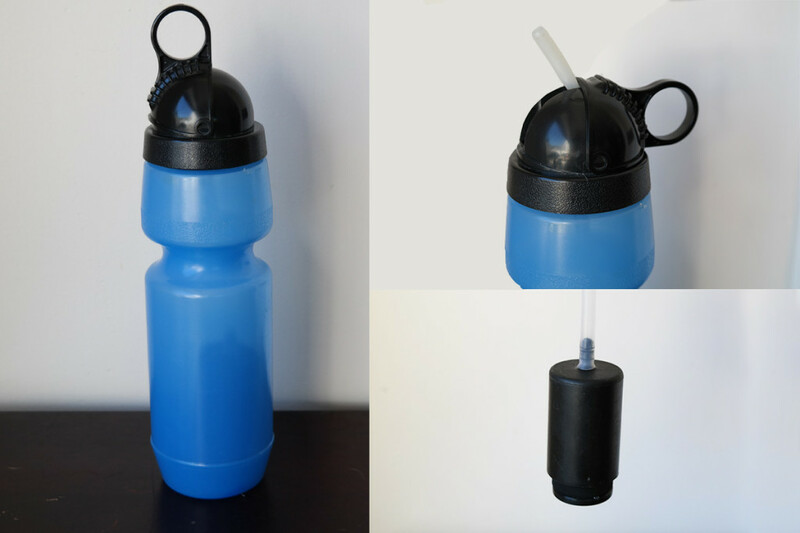 The bottle (without lid) is about 8″ tall which makes it difficult to fill to capacity in some sinks or water fountains. Many times the bottle could only be filled 1/2 or 3/4 of the way up because we had to tilt it, especially trying to fill from the low pressure fountains. The other negative we found was using the bottle on an airplane. Due to the change in cabin pressure, when the top is flipped open, water will shoot out from the straw. One solution is to get ready to catch the water with your mouth or buy that $4 bottle of water in the airport before you board – unless of course you feel like making friends with the person sitting next to you! The Sport Bottle is $30 on Berkey’s Website. Taking into account that a filter is worth around 640 bottles of water, at an average of $2.50 per bottle (on the road), that’s roughly $1,570 savings in water ($370 if filling from a dirty source as the filter will clogged up faster). Two thumbs up for the Berkey Sport water bottle. It solved the issues we had of spending money on bottled water, “funky” taste of safe drinking tap water, and access to safe drinking water. It’s one of our go to gifts for friends and family ranging from survivalists to frequent travelers. The Sport Berkey is also a good consideration for an emergency kit. If the power goes out and we need clean water, these are a good back-up to our Travel Berkey and it’s portable. Disclosure: This review represents our own opinions of the products. We were not compensated in anyway for this review and purchased all of the Berkey products referenced with our own money.